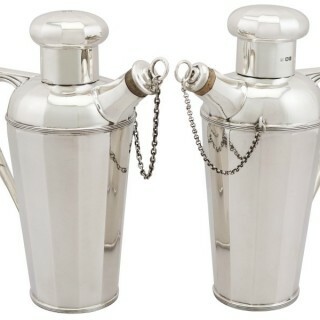 An exceptional, fine and impressive composite pair of antique George V English sterling silver cocktail shakers made in the Art Deco style; an addition to our wine and drinks related silverware collection. 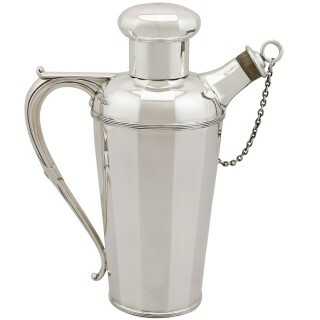 These exceptional antique cocktail shakers in sterling silver have a tapering panelled form, in the Art Deco style. 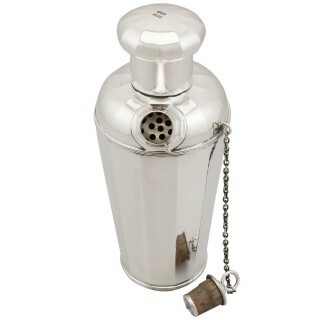 The surface of each George V cocktail shaker is plain and encompassed with an applied reed decorated girdle. 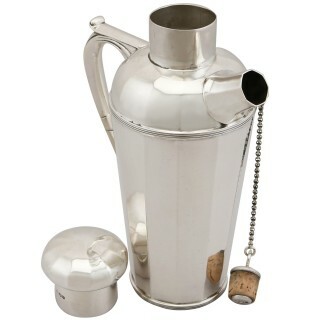 These cobbler shakers retains the original hallmarked domed push fit cover accented with further panelled ornamentation to the domed portion. 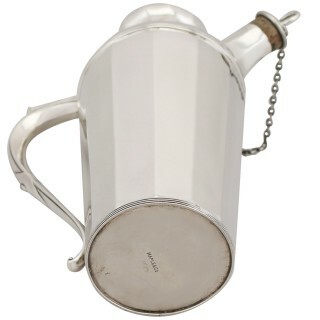 Each exceptional examples of antique silverware is fitted with a panelled spout with an integrated pierced decorated strainer and retaining the original cork stopper. 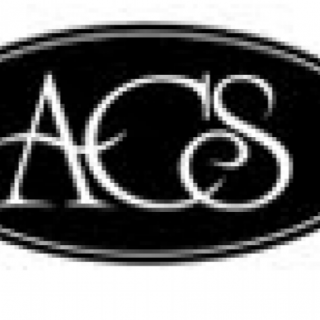 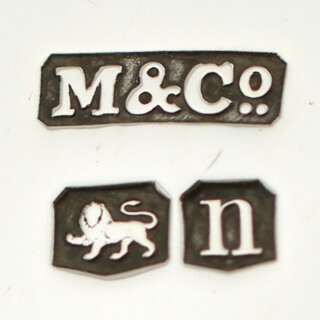 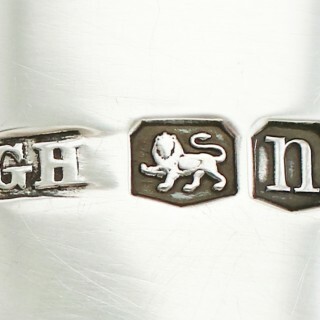 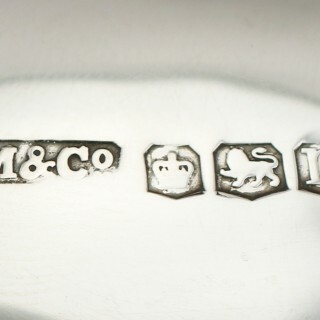 The stoppers are fitted with the original hallmarked sterling silver mounts and retain the original chain; the chain anchors to the aforementioned girdles to the body. 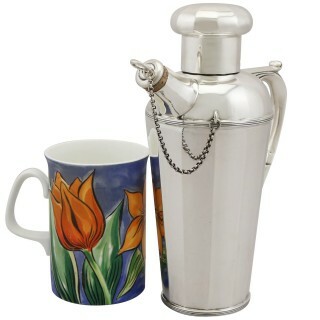 These antique sterling silver cocktail shakers are fitted with cast sterling silver handles, ornamented with a simplified Art Deco style lozenge design to each handpiece, in addition to scrolling thumbpieces. 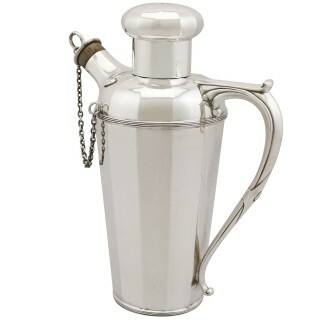 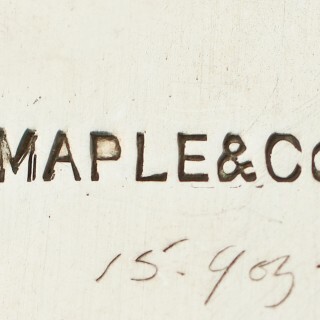 This composite pair of sterling silver cocktail shakers were both crafted in 1930 and assayed in Sheffield, England; one piece was crafted by George Howson of Harrison Brothers & Howson and the other by Maple & Co, which also features the retailer’s mark ‘Maple & Co’ to the underside. 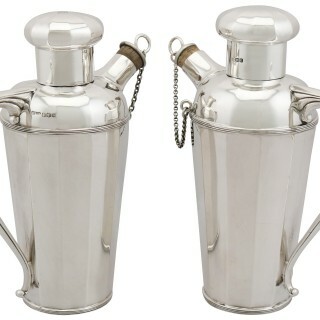 These antique cocktail shakers in sterling silver are an exceptional gauge of silver, exceptional quality and in exceptional condition. 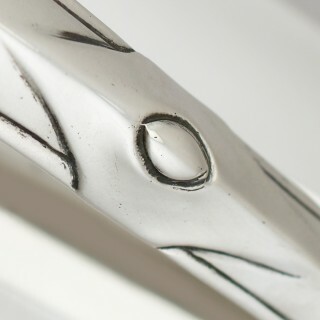 The cast and applied decoration is very sharp. 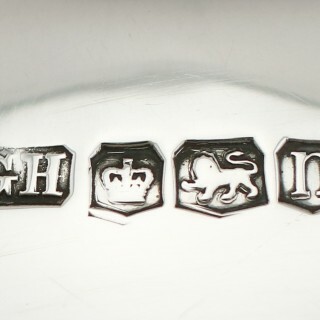 Full hallmarks struck to the surface of each body, in addition to part hallmarks to each cover and stopper mount are all very clear. 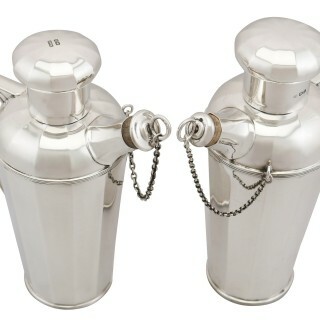 Reflections in photographs may detract from the true representation of these antique cocktail shakers.